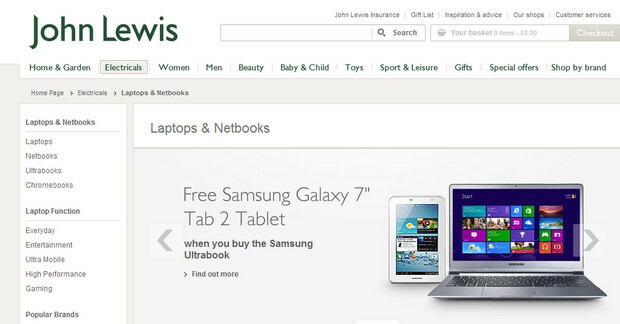 Keen to entice more punters on to their broadband deal, UK retailer John Lewis are offering 6 months free broadband with every web-connected device they sell – even down to the humble £69 Kindle. Purchasers of laptops, tablets, Smart TVs, smartphones and eReaders will be offered six months free broadband with a free router lobbed in, although they’ll have have to sign up for a minimum 12 month broadband contract. In other words, they’ll be getting a year’s worth of broadband at half the price, and after the six month freebie is over, users will have to fork out £31.50 a month, with no traffic shaping messing about. For those who like to paint go faster stripes on their computers, there’s a nippier 38Mbps fibre option for £38.50 a month, with a 100GB monthly limit and some traffic management. “Whether a customer comes in store to buy a Kindle or a Smart TV, they can now enjoy our broadband service for free for six months, without any hidden charges or difficult to understand terms and conditions,” said Adam Brown, spokesperson for tablets and telecoms at John Lewis. To get in on the deal, users will need a BT-compatible line or they’ll have to shell out £50 to get one installed. However, the ‘free’ deal would also involve users signing up to a £13.50/month line rental and calls service, which seems a bit at odds with the “no hidden charges” to us. I make the cost for the first year with line rental at £270. By contrast PlusNet currently have a 12 months half price offer running. That works out at £228 for the year. Charges for a new phone line are the same, and you don’t have to buy anything. Unless you particularly want to support John Lewis (which to be fair are a pretty ethical company) I can’t see how it makes sense….